Earlier this summer, we drove our oldest son to a military-style boarding school four hours away from our home. It was a decision he made and after the long drive there, we went through intake processing with him, hugged him, and said goodbye for five and a half months. It was the hardest thing I've ever done. This was not my Plan A. It wasn't even my Plan B or C.
There were a lot of tears, praying, talking, and evaluating that went into this process, but really, all of that was just God gently prying my plans from my clenched fists and turning me around and showing me a better way. If I let Him, He'll do it gently. If I don't, it feels more like ripping. So how do I know if this was the right decision? 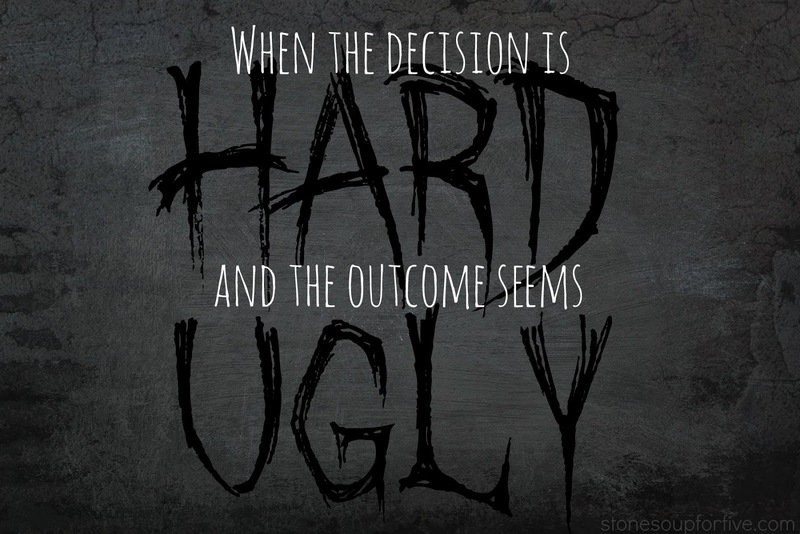 But there are some steps to follow when making tough choices. Steps learned them from wiser people than I. But it is scary. And it really, really hurts sometimes. However, I don't ever want to stand in the way of God's plan. I want to live with open hands, loosely held plans, and work with God the best I am able. 1. Usually the thing you need to do is the thing you really don't want to do. I did NOT want to send my son off to boarding school. My plan, when we started homeschooling was to fix the areas he struggled in, teach my boys to get along, have smiling faces and eager-to-learn homeschool days. They were going to learn ancient literature, take great science and Bible classes, go on to college or trade school and follow their abilities and passions and have a wildly successful life. It was all going to work so smoothly because I had a plan! I mean, the smiling faces in all the curriculum catalogs pretty much guaranteed it! 2. We can never really know what God's will is in specific situations in our life, but we can do the best we can by praying, seeking counsel, doing research, and letting God open and close doors. Be wise, but don't be a control freak. Eventually you have to "let go and let God". This part is HARD. Especially when you see bad mistakes lining up and bad choices being made. You guys, we can't control our kids, most of the time we can't even seem to control ourselves. But God never asked us to control our children. He tells us to teach them, train them, talk with them, guide them, and minister to them. Never once does He say to dominate, micro-manage, or freak out. I have a note card in my kitchen where I see it everyday based on 2 Timothy 2:23-25. It has my job and God's job listed out in neat bullet points. I am not the one who will change my child's heart, I could never do that, but I need to be kind, able to teach, be patient when I'm treated wrong, and correct gently. And that is the hardest job description I think I've ever heard. 3. Let God be God. I love how one of my friends put it "We've gotta let God be God and stop making Him in our own image." She preached a sermon to me as she reminded me that so many people get disappointed with God because He doesn't live up to their expectations. They thought He was going to come through for them, but He didn't. He didn't fix the problem or give a silver lining. Maybe we just need to come to Jesus because He is exactly who He said He is and rest in Him. I wanted God to give me kids that would be easy, joyful, and caring. I wanted him to make life easy for us, and pave the way for our boys to be blessed and live life how we thought best. But, God is God and He is the only one who knows the end. I need to let Him be who He is and just walk beside him, even though I can't see where my next step will take me. He doesn't ask me to be his co-pilot. He asks me to let Him care for and hold and guide me. I just need to follow. He is who He says He is, and He will do what He says He will do. 4. Check yo'self before you wreck yo'self. I love that saying. If I don't take the time to be in the Word, praying, and listening (checking myself), I always get wrapped up in a spiral of fear, doubting, worry, and ME. Reading His word gives me reassurance and hope. And with hope, even a droplet of hope, I can live life another day. Things will be okay. There won't be a fiery wreck at the end of this journey. There just might be an amazing plot twist in the storyline somewhere that I just can't see. God is God. I need do the best I can, think, pray, read His word, and then let God be God. I think I need to put your notes on 2Tim 2:24 on the bathroom mirror. They help me so much, as I OFTEN try to do God's job and forget mine! I needed to be reminded of my jobs and God's jobs. Thank you! Amen sister. You and me both! Praying everything is going good on his end as well as your end. He is doing amazing there. It's tough, but I'm so proud of him for sticking to it! Thank you! I just wrote that 2 Timothy verse down in the daily page of my bullet journal. Oh, how I have to remember this! I am sorry. I was homeschooling my girl in the hopes..... but my husband and I finally made the decision to send her to PS... I am sad, but I just can't give her what she needs. We looked at boarding school, but can't afford it now. I'll be praying for you and your boy. Thank you for sharing your Mother's heart with us and how God is working in your lives. Hugs to you! What a wonderful post! It is a blessing to read how you have processed this difficult season...I love how God's truth can apply to so many different situations too - not everyone just sent their kid to boarding school, but many are going through trials. Your words can speak into each difficulty, so thank you for sharing! What if the 'kid' is your husband...and he just doesn't get it? Thank you Kari, love your Ephesians study we're doing at our church Sabbath School class. Very good, btw. Thanks for creating it. Great to have you in our BJC FB group. Btw Kari...I had to let my boy go when my 1st husband left me. He was just 14 then. He built up hatred for me by the lies my ex told him about me. My son wouldn't talk to me for nearly 8 years. I never stopped praying and hoping God would open the doors to communication with him someday again. When my daughter graduated High School I had put together a couple photo albums for both the kids to present to them after her graduation. I wasn't allowed to celebrate with them for either of their high school graduations, just presented them with gifts afterward, having a good cry in the car before driving the 2 1/2 hours back home. Fast forward to 2015...my son told me that photo album I made for him made all the difference. He remembered all the love I showered on him growing up. He came back to me about 2 or 3 years ago and admitted that his father lied about me. We are rebuilding our relationship brick by brick. My daughter is finishing up her Officer Candidate school for the Navy in just a few weeks now. Will be powering a Navy air craft carrier soon...this mama's knees are knocking, but I know God's heart is bigger for her than mine is..she's in good hands. My prayers are unending in their behalf...God esp loves mamas who wear out their knees for their babies, no matter how old they are. Hang in there Kari...I'm right there with ya!